What happens when 2 unrelated LA geniuse kids grow up in different life paths and interview each other? Different lives and experiences but Brooks and Ella see the same effects of the evil syndicate on the people and the children. 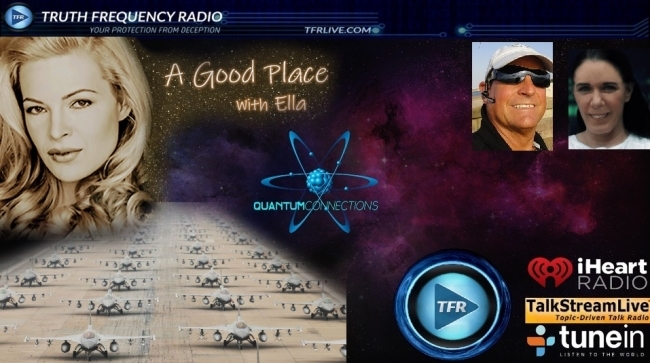 Ella has a fascinating background and brings a new analysis to the TFR Table. Ella is a radio show host, broadcastor, human rights activist & a leading advocate for victims of sexual assault, stalking, and both overt & covert crimes. After living a glamorous life in Los Angeles and working as an Executive in New York, she decided to dedicate her life to working with and fostering high-need children. Her life took a turn after experiencing predatory stalking and abuse and after a pivotal conversation with the noble whistleblowers Mr Bill Binney and Mr Kirk Wiebe. At that point in time, she felt compelled to become a radio show host and showcase modern day heroes, whistleblowers, educators and activists as well as spearheading global campaigns to address victims of various crimes. On her most recent show, aptly called “A Good Place”, Where Truth and Integrity Meet you can hear her interview today’s thought-provoking & and compelling premier guests every Friday on TFR, beginning at 2pm Eastern Standard Time and on Revolution Radio, freedomslips.com, every Tuesday beginning at 3pm EST. Don’t forget to checkout her brand new youtube channel by searching A Good Place with Ella where you listen to her previous formidable guests You can hear her whistleblower interviews at whistleblowerheroes.org and her Good Place website: www.agoodplacewithella.com which is coming soon. Trump said he wants 5G and 6G, the media laughed, but they didn’t know that China is building 6G. A Muslim soldier says her command sergeant major forced her to remove her hijab. Homeland Security secretary connects New Zealand mosque shooting with racist attacks in US. Trump Report: Didn’t collude, but we already knew that. What all the Russian collusion distraction kept us from learning is that in Syria, the US gave Russia its worst defeat. We also discussed hollow earth and alternative energy.